WhatsApp acquisition may have had a negative impact on the reputation of the company, it seems many users are planning to switch the service and a few of them have already done it. In our previous article, we have mentioned that why you should switch from WhatsApp to an encrypted Chat messaging service. Mobile messaging apps often used to deliver sensitive data or used for personal and corporate communications, so the data stored by the service provider should be encrypted end-to-end, which is not yet in the case of WhatsApp. There are many mobile messaging applications like Japan-based Line, China’s WeChat, Korea-based KakaoTalk, and Canada’s Kik, India-based Hike and many more, but they are not end-to-end encrypted messengers. Time is loudly announcing the need to shift to some alternates which provides end-to-end encryption for communication between two devices and respect your Privacy. There are a number of solutions available includes - Telegram, Surespot, Threema, TextSecure, RedPhone etc. 1.) 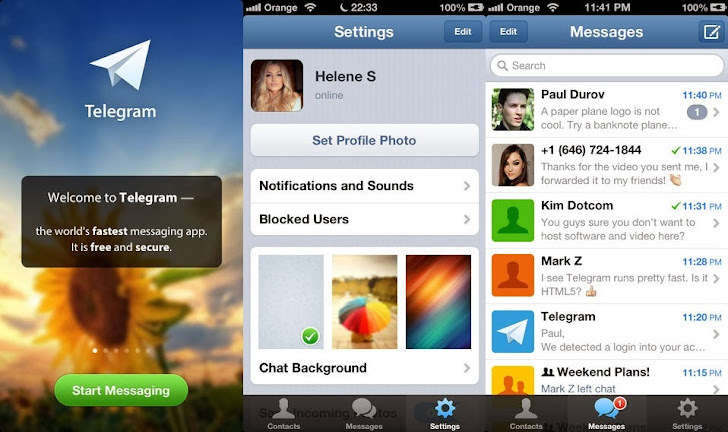 Telegram offers end-to-end encryption and have a 'Secret Chat' feature, that self-destruct messages after the conversation. The company is offering $200,000 Prize in Bitcoin to the first person to crack its Encryption. "We support two layers of secure encryption (server-client and client-client). Our encryption is based on 256-bit symmetric AES encryption, RSA 2048 encryption and Diffie–Hellman secure key exchange." Company states on their website. Regular and Secret chats are encrypted, but during Secret chat no data stored on the company server. There are a couple of more advantages Telegram brings which really are interesting. Telegram is free and an open source project, which means that the source code of the project is freely available, and according to their official website, 'Telegram has an open API and protocol free for everyone'. Download Telegram for Android and iOS. 2.) Surespot allows you to send and receive text messages, pictures and audio clip with end-to-end encryption. It uses 256 bit AES-GCM encryption using keys created with 521 bit ECDH which can only be decrypted by sender and receiver. Unlike WhatsApp, if you delete a message, it's deleted from the recipient's phone, too. Surespot supports multiple identities on a single device. Download Surespot for Android and iOS. 3.) 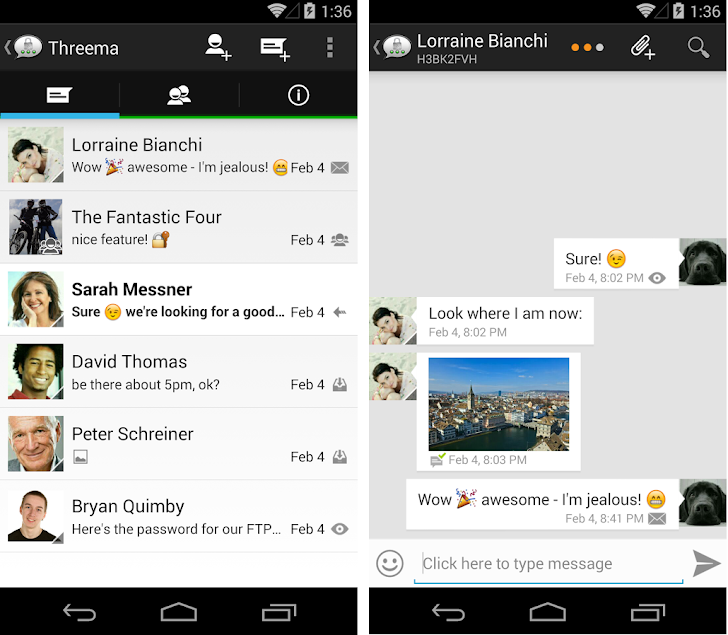 Threema is not free, but a perfect alternate for WhatsApp, use end-to-end encryption and gives you all features of WhatsApp like text messaging, image sharing, and voice chat as well. You can also sync your contact list automatically and manually. German users have started a shift to Threema after Facebook's acquisition and the app have become top paid app on the app store in Germany. Download Threema for iOS and Android. 4.) TextSecure and 5.) 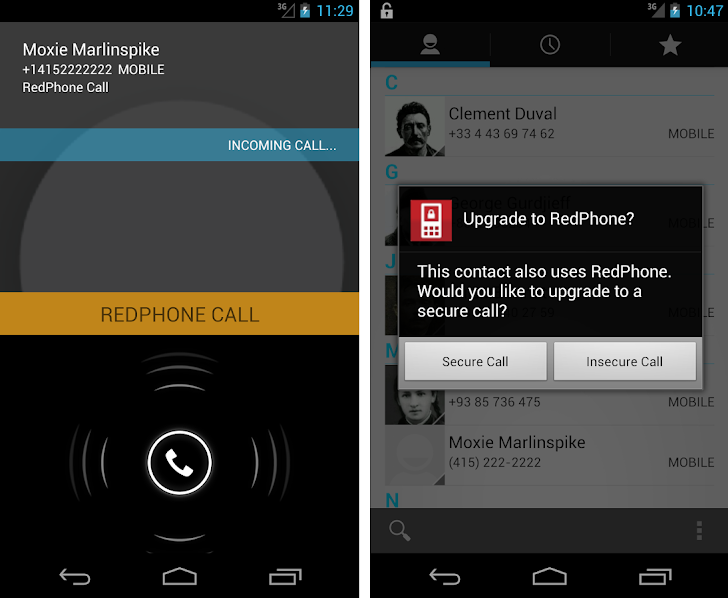 RedPhone also provides end-to-end encryption for messaging and voice calls respectively. RedPhone allows you to upgrade a normal call to secure call whenever it senses the possibility to fulfil the requirements. TextSecure encrypts the messages stored locally, making your information hard to leak even if you lost your device. Download TextSecure for Android and Download RedPhone for Android. So, if you are also now planning to switch, get any of above best suitable mobile messaging application for you.